Archery has a very long and profound history. Primarily, the bow and arrow was used for hunting due to it's effectiveness in accuracy and stealth over long distances. It was also used very successfully throughout history in warfare up until firearms became prominent during the 16th century. Archery was revived recreationally during the 18th century as a competitive sport while many people still choose to use them for hunting purposes. Archery also remains as an Olympic sport in the form of recurve archery (discussed below). The recurve bow can be seen as an iteration of the traditional longbow. It gets its name from the way the bow's limbs bend toward the archer and then recurve away at the tips. This second curve gives an extra "flick" to the arrow as it leaves the bow. The modern recurve competition bow is what you will find being used currently in the Olympic archery format. 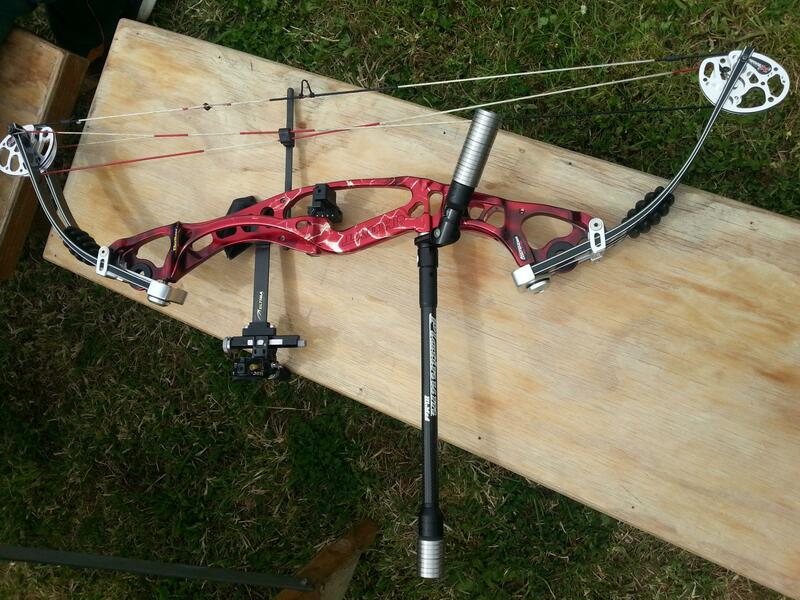 A modern recurve competition bow consists of a riser (handle), limbs, string, sight and stabilisers. Compound bows are the most advanced type of bow technologically and are easily distinguished by the cam/pulley system located on the limbs of the bow. The cams allow for an initially higher draw weight that eases off as you draw the bow back. Compound bows are ideal for hunting as the bows themselves are smaller, can be held at full draw for longer and are able to fling the arrows out faster than a traditional bow would. The compound target scene is growing larger and larger with requests that it should be seen along side the recurve bow at the Olympic games. There are many types of bows from many different cultures. 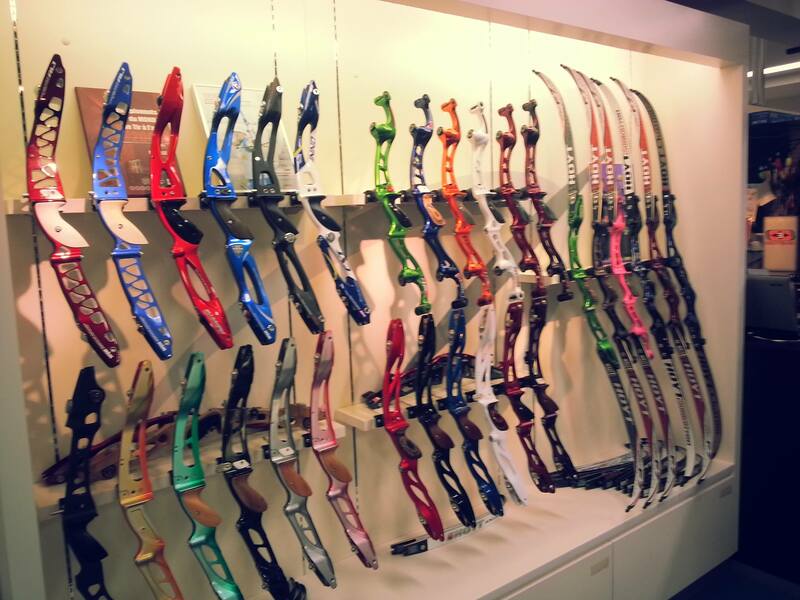 The ones mentioned above are the types of bows you will likely find at Yokine archery club and many other archery clubs affiliated with Archery Australia. At Yokine, we tend to focus on Target archery but also participate in the likes of Field and Clout. Target archery refers to stationary targets with a target face consisting of 10 scoring zones. Depending on your age, gender and bow classification there are many different types of shoots an archer can participate in. Yokine Archery tend to focus more on the shoots that you would find in competitive events such as local, national and international tournaments. These tend to be 144, 90 or 72 arrows in length. We score every 6 arrows; this is referred to as an 'end'. We also tend to group different distance scores between 5-6 ends or 30-36 arrows depending on which shoot you are scoring. One popular shoot you will see with recurve archery is the WA70/720 shoot (World Archery/70m/720 maximum points), also known as a ranking round, which is shot at the Olympics to rank archers before individual matchplay. More information on Target archery you can check it out at Archery Australia's website. Matchplay is an important discipline that is now a major part of target archery shooting. It is one of, if not the most recent competitive shooting formats that World Archery has brought out internationally. This format, combined with a ranking round, is what recurve archers compete in at the Olympic games. It consists of individual (1v1), mixed pairs (2v2) or team (3v3) categories. They are all scored the same way but the number of arrows shot and time allowed to shoot change per category. The main idea stems from the individual category where two archers compete head to head in a set based system (similar to tennis). Each archer shoots 3 arrow ends where the maximum score each end is 30 points. The archer with the higher end score is awarded 2 set points. The archer with the lower score gets 0 set points for the end. If the end is a draw, each archer is awarded 1 set point each. The winner is decided once one of the archers has 6 or more set points. If both archers end up on 5 set points each, a 1 arrow shoot-off is used to decide the tie. Matchplay in the open division (and Olympics) is always shot at 70m. In Field archery there are typically 24-48 different targets. 24 targets is one round and two rounds can be scored be repeating same target setup or using a different set of 24 targets. The targets are set up in fairly unique locations such as fields, forest or bushland and sometimes urban environments. Targets will be set up between 5m and 60m (age/class dependent) in 5m increments. There are 4 different size faces that can be used depending on the distance of the target and a certain distance may use more than one different sized target face. Only three arrows are to be shot by each archer at each target and target values range from 1-6 points. Field archery faces also look strikingly different from normal target faces in that the values 1-4 are all black in colour and the 5-6 rings are gold. Field shooting also comes in two flavours; marked and unmarked. Marked field will tell you how far away each target is (within 1-2 metres) whereas Unmarked shooting you have to make your own judgement of the target's distance. The Clout discipline is quite different to the other formats and its origins come from wartime archery where arrows would be shot up towards the sky and lobbed at a large target area on the ground. Distances range between 100-180m depending on age and bow type and flags spaced out horizontally are used to indicate the scoring zones. The middle is indicated by an upside down triangle shape known as the clout. 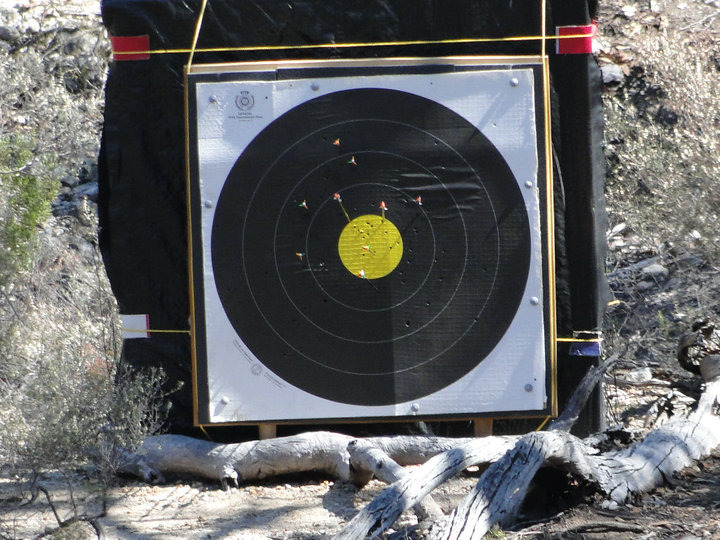 Scoring zones in Australian Clout are similar to that of target shooting (1-10). Other countries may use a different system. At Yokine members typically train 4 days a week; Saturday, Sunday, Tuesday and Thursday. Casual and social archers tend to shoot 1-2 days a week. International archers will ideally be wanting to shoot 5-6 days a week while also doing work at the gym. These archers will likely also be shooting 150+ arrows each day and between 200-300 on weekends.